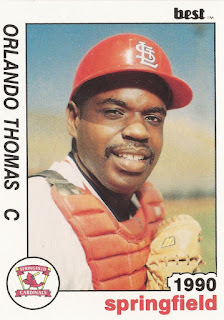 Aquinas College catcher Orlando Thomas played well in this May 1985 game and his Cavaliers took the win, according to The Nashville Tennessean. Thomas went 3 for 3 on the day, including knocking a two-run double in the eighth that proved the game-winner, according to The Tennessean. Thomas went on from Aquinas to a career in the pros. He played six seasons, getting a brief look at AAA, but he never made the majors. 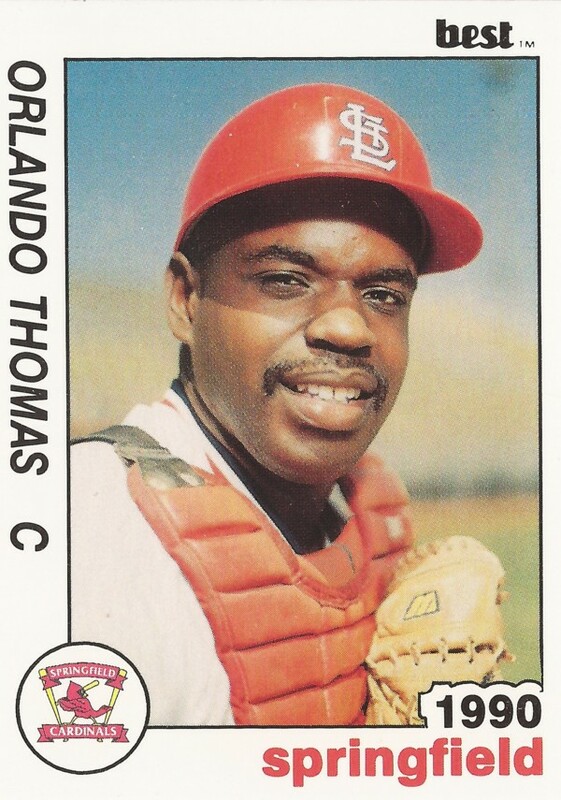 Thomas' career began in 1986, taken by the Cardinals in the 11th round of the January draft out of Aquinas. Thomas started that career after attending a Cardinals scout's camp the previous year. He started with the Cardinals at rookie Johnson City. He got into nine games, going 2 for 12. He moved to short-season Erie for 1987, hitting .200 over 43 games. He played most of 1988 at single-A Savannah, then briefly saw single-A St. Petersburg. He got into 50 games total, with a .248 average. Thomas did the same in 1989. He hit in seven-straight games in August for Savannah, hitting two home runs in that stretch. He played 1990 between single-A Springfield and St. Petersburg. He got into 42 games, hitting .198. In 1991, Thomas turned player-coach at Springfield. He played in nine games there, but also saw eight at St. Petersburg - and four at AAA Louisville. He went 3 for 11 at Louisville. That year ended his time as a player. Thomas then turned full-time coach. He served 1992 and 1993 as a coach at Johnson City and 1994 at short-season New Jersey.